***PLEASE COMBINE PURCHASES*** I have a bunch of stamps that I am going to be selling! Stamps may be removed for shipping FREE DOMESTIC SHIPPING!! $2.00 worldwide & .10c each add'l I will take pics of front and back but feel free to ask any questions prior to bidding and good luck! My nautical gear is in use in 37 countries and on 5 continents. GRAN LOGIA DE HONDURAS September RARE SERIES CPL. Siehe Scan. Brief/Karte oder Marken nur im Scan leicht beschnitten. Marken sind vollständig. (Condition: MNH. / weight etc.). Scans are provided for a reason. Mint = With original gum. Foreign orders. Obtaining Certificates of Authenticity. 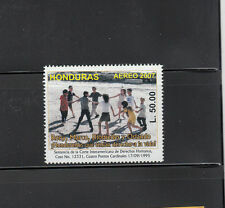 HONDURAS 1892, 400th Anniv. of Columbus Discovery, Full Set, Unused. 1892 400th Anniversary of the landing of Christopher Columbus. Full set, unused. This is part of a large, old collection being broken up. Heavy in Victoria British Colonies which will appear as I sort through. 1866 2r black on green (#1),complete central fleur de lis cancel, roughly separated, torn slightly into design at left and closed 10mm tear,very rare used, VG. The pages are complete for the period and in nice shape. There is over 100 pages, so you will receive more than is shown in the scans. The Three Ring Green Scott Binder and Dustcase are in very nice condition. Up for auction is a beautiful commercial cover from Tegucigalpa Honduras to Willemstad Curacao Postmarked august 10, 1936. Good condition . Nice stamps and cancels. 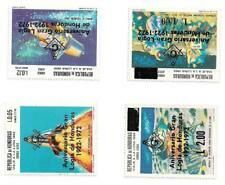 Via KLM Shipping will be a flat $2.00 first class mail in the US and $3.00 postage to mail anywhere in the world. Questions? Please contact me at: azteccollectables at hotmail.com. Check out my other online auctions of rare and vintage stamps. My e bay store, Aztec Collectables, has a fine and growing selection of unique covers, stamps and postcards. Please make pay arrangements within 72 hours of winning the auction. I will combine shipping on multiple wins, if you want combined shipping wait until I invoice you. HONDURAS #32 // #113 (3) DIFF. XF-S PLATE PROOFS ON INDIA EX-GREEN BQ3917. Obtaining Certificates of Authenticity. (150x100mm) ESSAY for each. all with transparent overlay for lettering and mounted on 240x190mm white board with black cover sheet, 50c beautifully HANDPAINTED, others graphic (x3) or printed logo (x2). Beide Marken mit seitlichen Bogenrändern. Honduras: 1866, 2 Reales schwarz auf grün und rosa, Luxussatz. Mi.Nr.1,2 #60. Mint = With original gum. Obtaining Certificates of Authenticity. O = oblitéré / used. TB = VF = très bon / very fine. B = F = bon / fine. ST = standard / average. Un certificat d'expert engage celui ci sur l'authenticité de la pièce signée. = MNH = neuf sans charnière / mint never hinged. OVERPRINT U.P.U. ANNIVERSARY 1874-1949 MINT NH. HONDURAS SOUVENIR SHEETS 1890 -1940. TWO (2) DIFFERENT Authentic. They are IN PERFECT CONDITION- THEY CURLED UP A LITTLE IN MY SCAN. HONDURAS - VALUABLE COLLECTION - ALL OLDER - MANY BETTER >150 STAMPS - LOOK! UNCHECKED FOR VALUE AND YOU WILL NEVER FIND A BETTER VALUE. WHO KNOWS WHAT YOU WILL FIND?. A WONDERFULLY INEXPENSIVE WAY TO FILL YOUR ALBUM SPACES. YOU WILL RECEIVE EXACTLY WHAT IS IN THE SCAN. GENERALLY GOOD CONDITION BUT EXPECT A FEW FAULTS. TWO PAQUEBOTS. S.S. PLATANO & S.S. SANALOA. HONDURAS 1932-1940. 1900 cover to Pennsylvania (backstamp). In excellent condition. Great marks and cancels. Up for auction is a beautiful first day cover FDC from Tegucigalpa Honduras To New York USA . Beautiful stamp and cancels. Postmarked October 15, 1946 . In excellent condition. Priced to sell. Very nice postal history. Airmail Stamps set #427/33. Shipping will be a flat $3.00 within the continental U.S. for USPS mail. Overseas airmail shipping is $17.00. Questions? Please contact me at: azteccollectables at hotmail.com. Check out my other online auctions of rare and vintage stamps. My e bay store, Aztec Collectables, has a fine and growing selection of unique covers, stamps and postcards. Please make pay arrangements within 72 hours of winning the auction. I will combine shipping on multiple wins, if you want combined shipping wait until I invoice you. NUMBERED IN GLASSINES. SEE PICS FOR WHICH ONES ARE IN THIS LOT. 1970 ANO DE SOBERANIA NACIONAL. HONDURAS SOUVENIR SHEETS. INDIVIDUALLY NUMBERED. COMPLETE SET THREE (3) DIFFERENT Authentic. Honduras Scarce Early Flight Cover 1929 to Philadelphia and back stamped. Scott #C99(6x), C100, C153(7x), C154. a pretty image. HONDURAS, SCOTT # C37 C40 C41 C43(4), TOTAL 4, MINT HINGED. The Minkus Album begins at Page 10 (1913) an goes to page 46 (1961). Also has page 1. Includes Scott International pages for 1959 to 1974. HONDURAS, SCOTT # 19, MINT HINGED. VALUE (PINK & BLACK) 1877 COAT OF ARMS IMPERF.